It’s important to make their nursery a peaceful haven where they can play, rest and feel safe. At the same time, we can get stuck on the same colourway when decorating for boys and girls. 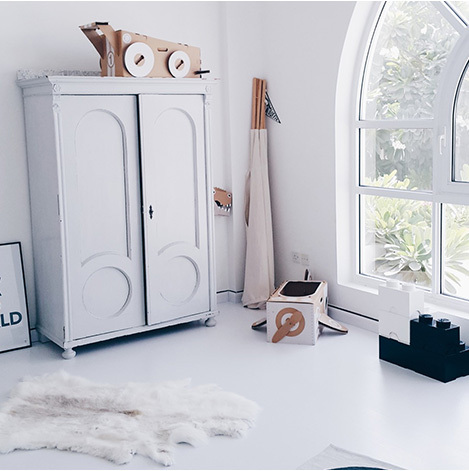 Enter Live Loud Girl, one of our favourite interior stylists based in Dubai, to help you in your decorating journey. Starting from walls all the way to the accessories, here is what you need to know to transform your little girl’s room into a cosy and inviting space. To create a perfect space at home, we always like to start with a blank canvas, preferably white. From there we like to bring in colour, prints and structure. 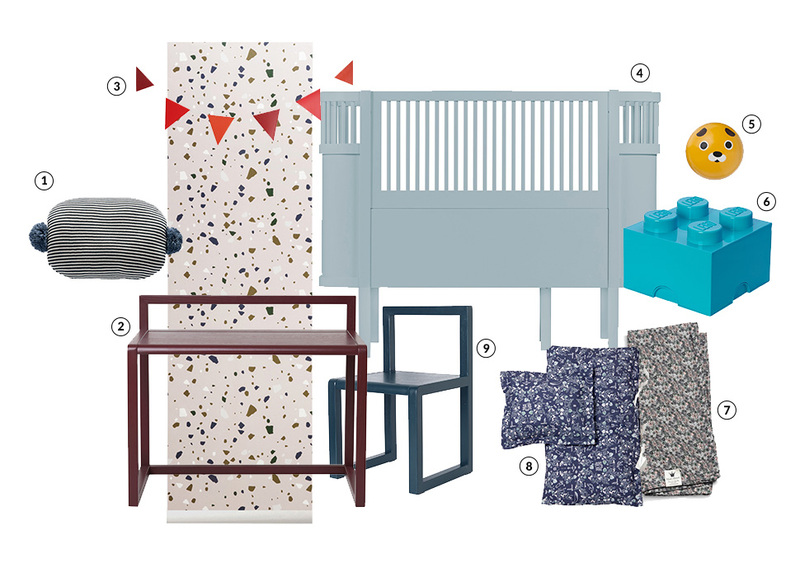 This mood board is for a girls nursery yet not a typical one. Yes, we will bring in pink, a colour that we love to use, yet we also chose for some bold prints and statement pieces. 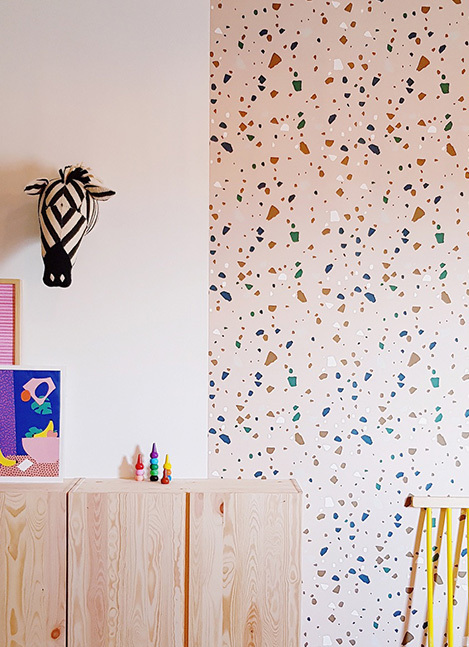 For the wall, we love the Ferm living terrazzo wallpaper. Although it’s graphic, it’s a great starting point as you can get inspired by all the different colours. It will also still look amazing when the kids grow up! Playing around with prints is so much fun. There are no rules! Mix it up until you find the perfect match. We love the Elodie Details blanket with the Garbo & Friends bedding. 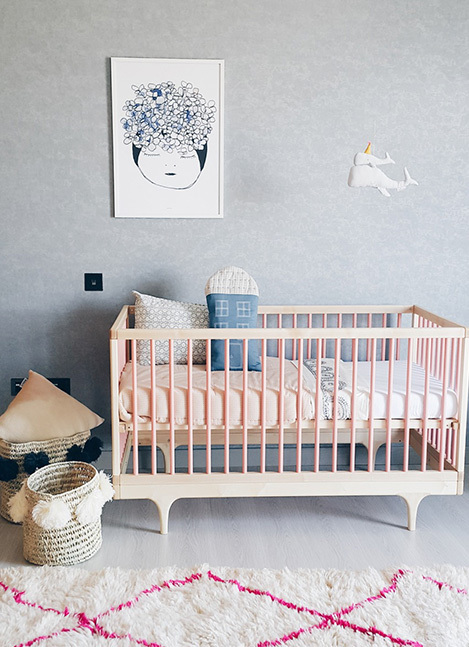 This flowery combo goes so well with the classic and timeless Sebra crib. Adding some cushions like the adorable Bonbon one from OYOY makes it playful and adds a necessary structure. We love investing in furniture that goes a long way. The clean and simple design of this desk and chair are perfect for kids rooms as they will go with almost any style. Storage is such a basic item for any room and we love the new LEGO blocks with drawers. They are perfect for small baby items like diapers, cream and wipes and later for toys, dolls and colours. The yellow dog hook adds some freshness to the room to finish it off. Do girls nurseries have to be pink? We don’t think so! Let’s create something that is not typical! Don’t be afraid of change. Change makes your house a dynamic place. You don’t need to buy new furniture to update your room, with a little creativity you can come a long way. Shop around the house and grab some items from your other rooms. Be brave and go for something out of the ordinary. Adding a statement wall, for example, is a very easy and affordable way to bring in some colour. We love combining affordable products with small label designers. Adding vintage items to a room gives it more soul. Let kids be kids. Make their space playful and fun. Remember to give them a room that they can grow into, something that they will still love in a few years time. We love bringing in different materials, patterns and colours. Rugs, for example, are a great way to bring everything together and at the same time adding some needed structure. Style a space according to what it is for. A playroom needs to be playful to trigger creativity and have lots of storage, a bedroom needs to be serene to accommodate long peaceful nights.